filling-in paper forms! Use FormDocs Electronic Forms Software instead and you'll save money, save time, and work with your forms more efficiently than you ever thought possible! Here's how: scan and convert your paper forms, or convert your Word and PDF documents, or use FormDocs' library of ready-to-use sample forms, or design your own custom forms. 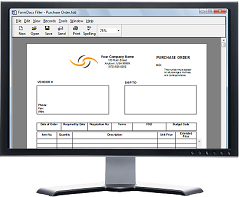 Proposals, quotations, purchase orders, work orders, invoices, reports... any type of form you can imagine. Make your forms as simple or as complex as you need; optionally add calculations, auto-fills, pre-fills, field validations, and digital signing. Filled-in forms are stored in a simple-to-use document database where you can find any form out of thousands in just seconds. 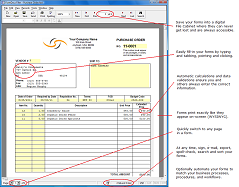 Forms can be printed, e-mailed, exported, and shared on a network. Automatically populate forms with data from your databases and spreadsheets, or create custom solutions with built-in VBA scripting. Best of all, Formdocs is simple to use and requires zero administration.